Rev. 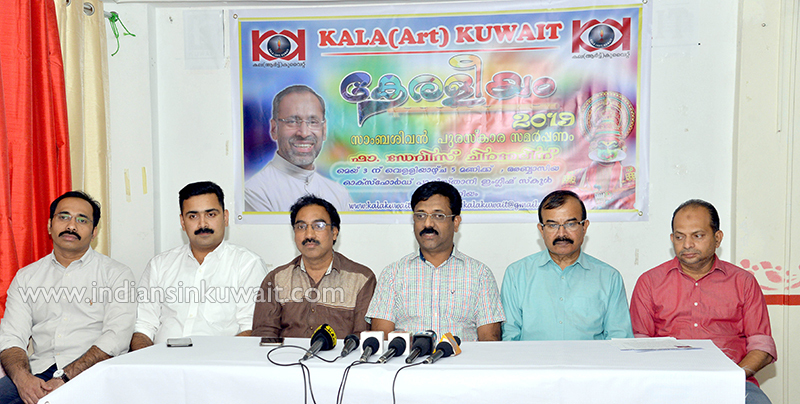 Father Davis Chiramel, popularly known as Kidney Priest, has been chosen for the “Kala(Art) Kuwait - Sambasivan Award” instituted by Kuwait-based Indian socio-cultural organization 'Kala(Art) Kuwait' for the year 2018. Fr. Davis was designated for the award in view of his outstanding contribution in the arena of Charity and Humanitarian activities, the organizers said in a press conference. The award, comprising Rs. 50,000 and citation, would be presented in a function in Kuwait on Friday, 3rd May 2019 at Oxford Pakistani English School, Abbasia at 5 pm onwards, according to ‘Kala(Art) Kuwait’ President Mukesh V. P., Vice President, Sameer P., General Secretary P. K. Sivakumar, Treasurer K Hassan Koya, Program Convener Rakesh P. D. & Media Convener Jaison Joseph. This award was instituted in memory of eminent 'kadha prasangam' artist late Prof. V. Sambasivan. Those who had won this prize in previous years are, eminent Writer U. A. Khadar, Vaisakhan (Chairman of Kerala Sahitya Academy), Akbar Kakkattil, Poet and Theater Director Karivelloor Murali, Critic and Social Activist Dr. M. N. Karasseri, Dancer and Actress Dr.Tara Kalyan and The well-known poet laureate of Kadhaprasanga Art, Dr. Vasanthakumar Sambasivan. Fr. Davis Chiramel has been singularly responsible for half a million people in India pledging their kidneys for donation post-mortem. And, moving a step ahead of his priestly duties to the laity, he has walked the talk by setting an example for universal brotherhood and compassion—by donating his kidney to a man of the Hindu faith. He chairs the Kidney Federation of India, and serves as the general secretary of Accident Care and Transport Service (ACTS). Fr. Davis was born at Aranattukara on 30 December 1960 as the son of Chiramel Chakkunni and Kochannam. He did schooling at Tharakan’s High school, Aranattukara and later went to St. Mary's Minor Seminary, Thrissur and to Aluva Pontifical Seminary for further studies.